Hello Stampers and Happy Friday! It's time for a DT challenge over at the Fun 'n Flair blog. 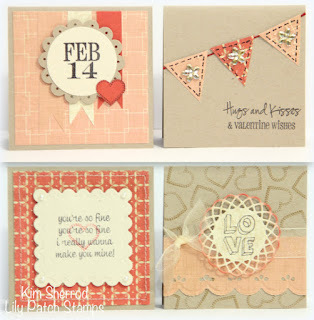 This month's DT challenge is to create a set of 3x3 cards using the It's All About Love set. I haven't made 3x3 cards in such a long time. It's actually quite fun to create these. I wanted to make them all different. There are just so many sentiments to use. I've been using alot of sentiments from this stamp set and still haven't used up half of it. This is one stamp set that you would be able to use over and over not just for Valentine's Day. These 3x3 cards would make a wonderful gift set. The DT has created beautiful 3x3 card sets over at the Fun 'n Flair blog to give you some inspiration. I havent made 3x3s in like...forever. Love these little darlings you've made. So sweet! Hi Kim what a beautiful set of cards for our love challenge. I love the colours. Thanks for joining us at CRAFT this week. Hope to see you again soon.